Why? Because after three decades, it still makes me laugh. And, at the time, I would have loved being able to watch this sketch whenever I wanted.With a splashy exhibit opening in Toronto later this month, it seems timely to enjoy this chestnut. 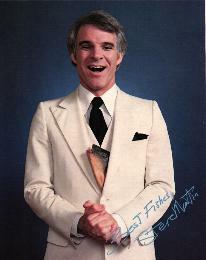 There are two sides to the Steve Martin ledger. On the one side (and it's hefty), there are his first couple of albums, his SNL appearances, his better movies and especially his writing. On the other (and it's heftier than it should be), his weaker movies, especially the family-friendly fare that he's been taking to pay the bills. I like both the wackiness of Let's Get Small and the dapper prose of Pure Drivel and Shopgirl, not to mention the elegance of Roxanne and inspired cameos like the dentist from Little Shop of Horrors. My world would not be lessened if, say, Cheaper By the Dozen and the like disappeared. I have little interest in seeing the Pink Panther remake, although I'd be delighted if my suspicions were proved wrong. I'm looking forward, though, to seeing Martin in his prime. And Prince is the musical guest. Should be interesting. It was a long way from Let's Get Small to Pure Drivel; either way, I've been a fan of Steve Martin's comedy, from arrow-through-the-head wackiness to the button-down, letter-perfect style of his New Yorker essays. Either way, Martin has been given the Mark Twain Prize for his contributions to comedy. Martin and Carson made people laugh with stand-up routines; both also showed a talent for the written word. Both wrote stingingly funny (and short) essays for the New Yorker. I can only recall reading one by Carson, but Martin's have been quite good, and were collected in the book Pure Drivel. Ideal bedside or airport reading.